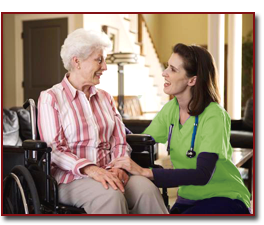 Home Care Aides represent one of the nation’s largest and fastest growing occupations. Although our times are marked by technological innovation, caregiving remains an inherently human function. It is a high‐touch, time‐intensive, and intimate part of human life. While many aides take great personal satisfaction from helping elders and people with disabilities, caregiving is also a real job, a fact too often overlooked. Home care work can be tough and demanding. It requires skill, patience, and endurance. All health care workers who lift and move patients are at high risk for back injury and other musculoskeletal disorders. A work-related musculoskeletal disorder is an injury of the muscles, tendons, ligaments, nerves, joints, cartilage, bones, or blood vessels in the extremities or back that is caused or aggravated by work tasks such as lifting, pushing and pulling. Symptoms of musculoskeletal disorders include pain, stiffness, swelling, numbness, and tingling. Home health care workers do many of the same tasks as workers in traditional healthcare settings, but conditions in the home setting often make the work more difficult. Home healthcare workers most often perform heavy work, like lifting and moving patients, without assistance. 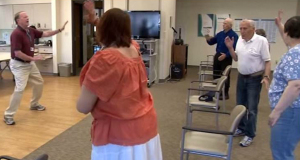 Patient-handling tasks often involve motions that challenge a home health care worker’s body including twisting, bending, stretching, reaching, and other awkward postures. Health Care workers are now have the highest rate of on-the-job injuries over all others. That includes the traditional injury leading industries like manufacturing and construction. It only seems natural that the largest growing industry is also the industry that leads in injuries but it doesn’t have to be this way. Home Care Aides can protect themselves using assistive devices and by following safe patient handling guidelines. 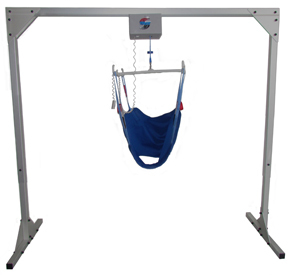 Traxx Mobility Systems manufactures the Titan 500, a freestanding overhead patient lift system for the home. The overhead patient lift allows a single caregiver to transfer a patient without fear of injury. The lift system fits in any bedroom and works with any bed and wheelchair combination. The rechargeable electric motor raises and lowers a patient while the overhead track allows the caregiver to gently glide the patient to complete the transfer. The system even comes with a machine-washable universal sling. For more information on Traxx Mobility Systems Titan 500 Overhead Patient Lift, visit our website, find us on Facebook and watch our YouTube channel. As America ages, with the number of people aged 60 and older expected to double from 2000 to 2030, the nation has an opportunity to help people age with independence and dignity. Area Agencies on Aging (AAAs) help older adults do just that. Each AAA shares a clear mission: Preserve the independence and dignity of older adults by providing services and supports that enable them to remain living in their homes and communities for as long as possible. Established under the Older Americans Act (OAA) in 1973, AAAs operate a complex delivery system that provides access to home and community-based services for older adults. Despite the word “aging” in their name, today’s AAAs are serving a broader population base, including people under age 60 who qualify because of disability, impairment or chronic illness. Tight federal and state budgets make it extremely difficult for the Aging Network to maintain existing services under these traditional funding sources or even contemplate expanding those services to meet the current and future needs of a rapidly growing aging population. Nearly all AAAs (98 percent) draw on multiple sources of funding in addition to OAA dollars—most commonly, state general revenue funding, local funding, and Medicaid waiver programs. Yet the state funds on which AAAs rely heavily may also be in jeopardy. While each AAA provides a set of core services under the OAA, including planning and program development, home and community-based services and caregiver support, they also may offer distinct services tailored to the needs of older adults in the community. AAAs coordinate and support a wide range of home and community-based services. including information and referrals, meals, in-home care, transportation, employment services, senior centers, adult day care and more. With a grant from the U.S. Administration for Community Living, the National Association of Area Agencies on Aging (n4a) partnered with Scripps Gerontology Center of Excellence to learn how AAAs are enhancing and evolving services to meet community needs in the coming years. Changing services to meet the needs of an expanding consumer base. Continuing their focus on keeping people healthy and living in their homes. Managing changes in the funding landscape. Today, AAAs are serving a broader base of the population than ever. Consistent with their mission to help all people stay in their homes longer, AAAs are expanding their reach beyond older adults and caregivers, especially to younger people who have disabilities and veterans. Good health can support successful aging and independent living. Today’s Area Agencies on Aging (AAAs) are working harder than ever to keep older adults and their caregivers healthy. Almost every AAA delivers healthy aging programs. And, AAAs also offer critical long-term services and supports (LTSS) which increase patient safety, improve quality of care and reduce health care costs. Traxx Mobility Systems has worked with Michigan’s AAAs to get our Titan 500 Freestanding Overhead Patient Lift to those in need through the MI Choice Waiver program. This has allowed those with meager means to receive an assistive device which has allowed them to stay in their home longer. The Titan 500 allows a single caregiver to transfer a patient from bed to wheelchair safely and efficiently and without fear of injury. For more information, visit our website, find us on Facebook or watch our YouTube channel. Health care for the disabled or elderly does not always take place in a hospital, nursing home or doctor’s office. Most of the your loved one’s health care is going to take place in the home. Is that a good thing? We think so. People are healthier in their home and costs can be reduced significantly. Family caregivers also have their loved ones best interests at heart. 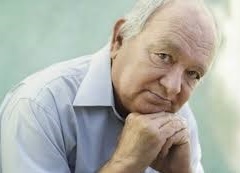 However, caregiving at home can take its toll on the caregiver and proper preparation must me made. Ninety million U.S. caregivers provide daily care for their loved ones, enabling them to stay at home longer where they are happier and healthier. Traxx Mobility Systems supports family caregivers with our TITAN 500 Overhead Patient Lift. Traditional floor based patient lifts are difficult to use in the home. Our unique system fits in the bedroom and allows a single caregiver to transfer a loved one without fear of injury. A rechargeable electric motor provides peace of mind and the system is designed to lift up to 500lbs. Traxx Mobility Systems is lifting the standard of home care!